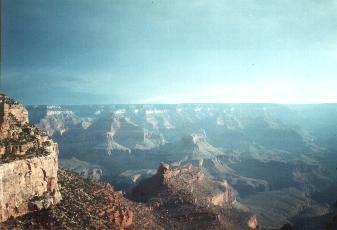 grand canyon, september 1995 - This was one of my dreams coming true : to see the biggest canyon in the world I heard and seen so much about already. I was finally there, so I had to hike it. 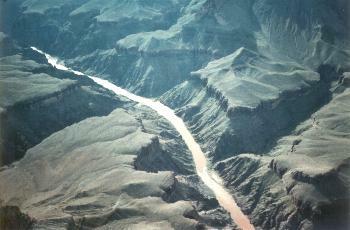 Since time was limited, I took one of the classic hikes, the one to the 'plateau point', about 2 or 3 hours hike down, from where you can see the Colorado river beneath. The hike starts at the visitor centre, where you can buy a 'I hiked the Grand Canyon' T-shirt, even if you only walked the rim... I bought some trail mix over there, and refilled my water bottle. To hike the canyon, you need at least 3 litres of water, but drinking water fountains are available every hour or so, you can refill on the way. The hard thing about Grand Canyon is that you start hiking down, hurting your knees in my case, and then have to go all the way up again. This seems obvious, but do not underestimate the canyon : it gets very hot in there, as it already was by the time I started. 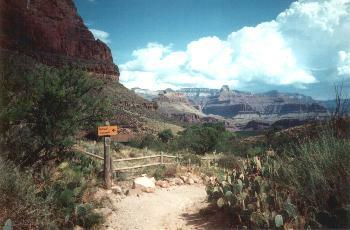 The vistas are beautiful as you go deeper and deeper into the canyon, there are flowers and cactusses , and squirels. I rested at 'Indian Gardens', a place with pick-nick area. As I arrived there, black clouds were coming in now. It had been clowdy all day but this change was very sudden. I hesitated if I would go further or not. Finally, I decided to go back up as it was clear a thunderstorm was coming in. About half an hour later, hell broke loose. It started to rain and hail, and soon there was also thunder and lighting. I luckily had my rain gear with me - as I always do when hiking. I had to stop for some time because this hail really hurt on my back and mud streams were coming down, crossing the path. The lighting struck some trees in the distance, there was smoke. This was totally different from what I expected Grand Canyon to be. Moments later, I continued the hike. There was one advantage : it was much less hot. By the time I reached the rim again, the thunderstorm was gone, but the clouds were still there and the views were somewhat misty now. 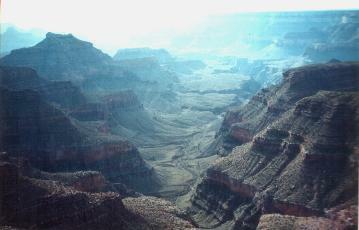 Next day, the weather was great and I took a helicopter flight above Grand Canyon. Although these flights are really the top of 'tourist things to do' ( the campsite I stayed was called by some 'little Vietnam'...), it was really spectacular and well worth the price.